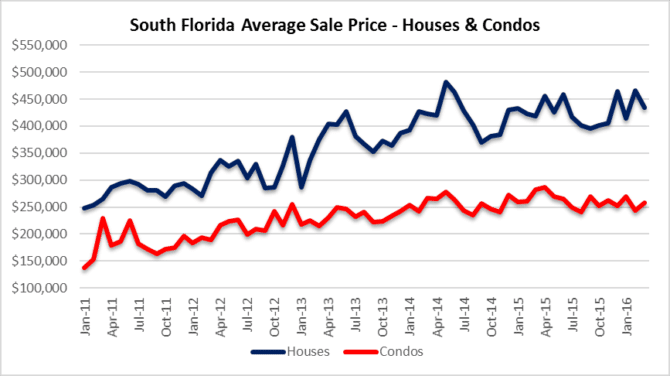 Our first chart today looks at the average sale prices of houses and condo properties in Miami-Dade, Broward and Palm beach County, Florida. 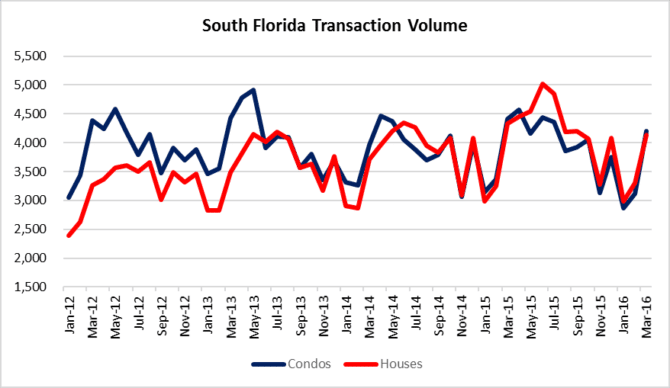 During the month of March, the average selling price of a single-family home in South Florida declined 7% from February to $434,683. The average selling price of condo properties actually rose 5% to $257,749. Keep in mind that a few multi-million dollar transactions can move the average prices, so we stress that one month in either direction does not make a trend. We usually take several months of data to determine the direction of the market. The listed inventory of houses and condos declined in March and that helps buffer any price drops for now. Anytime you see inventory grow for several months, it’s a safe bet that prices will gradually decline. It’s the simple economics law of supply and demand. The fact that transaction volume rebounded in March and snapped the downtrend is a positive sign. We have noted in previous posts that a few months of declining deal volume will accelerate price declines, so it looks like properties caught a bid last month and kept inventory from growing. You will notice that transaction volume still hasn’t regained the levels reached last spring and they probably won’t see those levels anytime soon. Miami-Dade County mortgage foreclosure filings increased 33% to 647 in March. The 2016 monthly average is up 35% from last year. 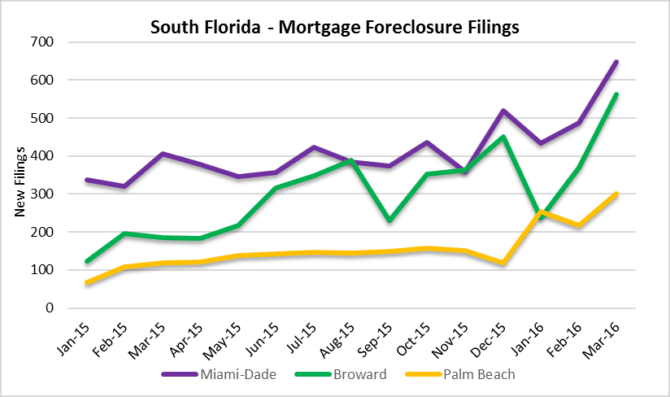 Broward County mortgage foreclosure filings increased 52% to 563 in March. The 2016 monthly average is up 39% from last year. 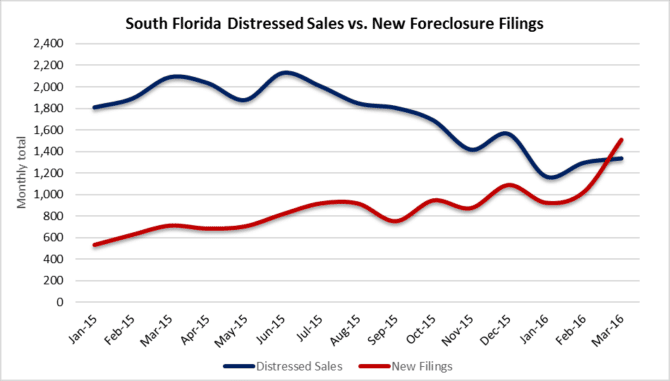 Palm Beach County mortgage foreclosure filings increased 38% to 301 in March. The 2016 monthly average is up 81% from last year. Another interesting metric that we monitor is the pace of new foreclosure filings compared to the pace of short sales and foreclosure sales. Given the large overhang of distressed properties in South Florida, you obviously want the pace of new foreclosure filings to stay below the pace of distressed sales. For the first time in awhile, we saw the level of new foreclosure filings (1.511) outpace the combined short sale and REO transactions (1,339). Although there is a very long timeline (over 1,000 days) for foreclosures to progress through the courts in Florida, this is not a good indicator. So if you think that distressed properties are a thing of the past in South Florida, think again! 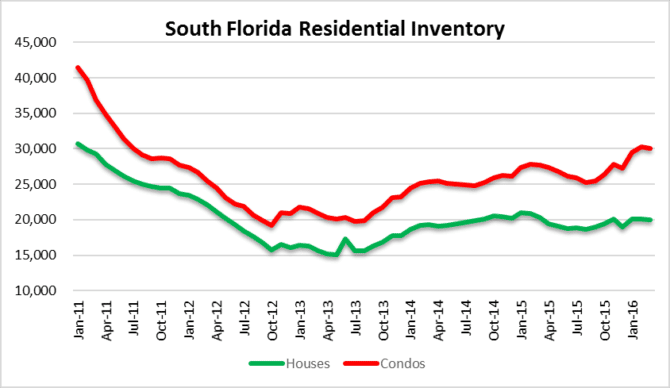 This entry was posted in Condo market, Foreclosure activity, Market Insight, Single-family homes, South Florida Real Estate and tagged Florida real estate, Fort Lauderdale condo market, Fort Lauderdale real estate, housing bubble, South Florida real estate. Bookmark the permalink. Trackbacks are closed, but you can post a comment.